Global football star Cristiano Ronaldo with Nike launched the CR Mercurial Vapor SuperFly II boot (pictured above) in Madrid, Spain. Inspired by Ronaldo’s lightning speed and effortless style off the pitch, the CR Mercurial Vapor SuperFly II combines high-performance innovation and heritage of the Nike Safari print. Nike originally introduced the print on the Air Safari running shoe in 1987, and the unexpected aesthetic transformed performance footwear design. 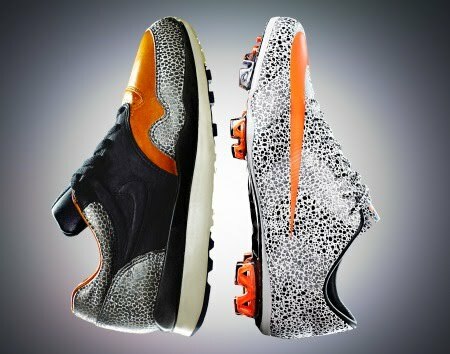 At the time, trailblazing Nike designer and father of the Air Jordan series Tinker Hatfield began exploring non-traditional materials, patterns and colors to use in athletic footwear and conceived the now legendary ostrich-skin print. The limited-run Air Safari quickly sold out and gained an ardent following for its striking design. Now the iconic print is back — this time on the feet of one of the best players in the world. The updated print has a stylized look, wrapping the entire boot and laces for a bold effect. Ronaldo’s signature CR Mercurial Vapor SuperFly II represents the first time the print has been applied to performance football footwear. The game’s fastest player demands a boot that not only reflects his personal style but also delivers superb traction and responsiveness. The CR Mercurial Vapor SuperFly II features the unique NIKE SENSE adaptive traction system where designers created a pair of adaptive studs in the forefoot that can extend and retract by up to 3mm, based on ground conditions and pressure exerted by the player. The new boots combines high-performance innovation and heritage of the Nike Safari print. Directionally positioned blades maximize cutting and allow for quick changes of direction, while secondary toe traction provides added toe-off power for those first critical steps. The result is a boot that enables greater speed in all directions. Nike Flywire, a lightweight composite that forms the upper, increases range of motion while locking the foot to the sole plate, ensuring maximum transfer of energy from the foot to the ground. The carbon composite chassis keeps the player close to the ground for improved stability and responsiveness. 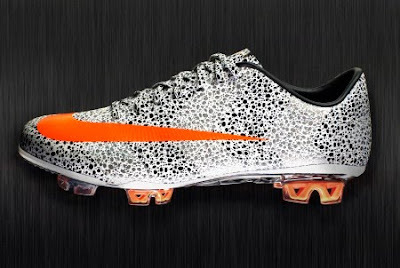 A Youtube clip of the "CR Mercurial Vapor SuperFly II"
In another nod to speed, the boot’s arresting Safari print is overlaid with a tonal chevron pattern that is illuminated in certain light. Designed to appear as a flash in a player’s peripheral vision, the reflective graphic can improve player awareness on pitch. The CR Mercurial Vapor SuperFly II also gives consumers exclusive access to training insights from top players and coaches through Nike Football+. Each pair of boots comes with a unique user code to unlock insider tips and Master Speed training content. The boot will be available at retail globally and online at www.nikestore.com beginning November 15. Nike Football+ can be accessed at www.nikesoccer.com.